I recently visited the South Rim of the Grand Canyon in midday sun with all the harsh contrast that goes with this lighting, and I wanted to get some good images even though the lighting was less than ideal. Since I couldn’t be there at sunrise or sunset, I decided to take what I could get at midday by capturing some images using High Dynamic Range (HDR) techniques in an attempt to soften the harsh lighting. 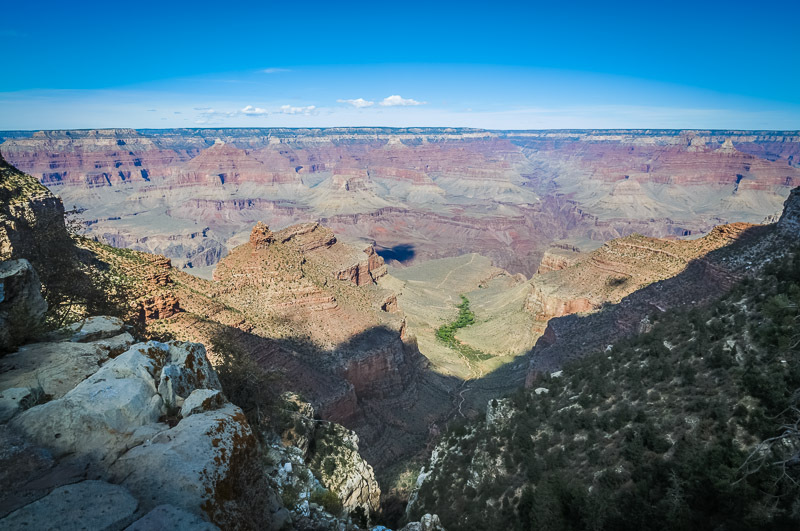 I took five images of this scene from the canyon rim, all at an aperture of f/8.0 and ISO 200, varying the shutter speed from 1/3200 sec to 1/200 sec. This gave a set of five images with one-stop variation in exposure over the set. I exported these five images from Lightroom 4.2 to Adobe Photoshop CS6 as an external editor, choosing the option to Merge to HDR Pro in Photoshop. As the images were imported to CS6 they were merged to produce a high-dynamic-range image which was automatically re-imported back to Lr 4.2 for stacking with the original five exposures. Click on the image here to see a larger version of this HDR image. One of the new features introduced in Lightroom 4.1 is the ability to tone-map 32-bit image files which contain additional image information beyond that found in the usual 16-bit (or 8-bit) files. I decided to test this new feature by saving the 32-bit file produced in CS6 back to Lightroom rather than allowing it to be tone-mapped in CS6 and saved to Lightroom as a 16-bit file. The resulting image, tone-mapped in Lightroom using this new capability, shows some subtle differences compared to the 16-bit image above. Click on the image to see both results and decide which effect your prefer. I also have Photomatix Pro software which can combine images to produce HDR output, including 32-bit output, so I exported the same five images to Photomatix Pro and retrieved the 32-bit file for tone-mapping in Lightroom 4. The result was less pleasing to my eye, perhaps because of some color shift which was introduced when I tone-mapped the image. Again, click on the image to compare the result to that obtained using the above methods. Eight bits is represented as the binary base of 2 raised to the 8th power (2^8) which gives 256 levels of colors which can be represented in the image. Sixteen-bit color refers to the base 2 raised to the 16th power (2^16) giving 65,536 levels of colors possible, which is often referred to as “High Color.” Clearly, 2^32 gives a much larger number of possible colors (a billion or more, depending on the configuration of the screen) and this is often referred to as “Deep Color.” Being able to tone-map an image containing so many colors would seem to be an advantage, so this feature introduced with Lightroom 4.1 is a welcome addition to the tool chest for digital photographers. Now all that remains is learning how to use this tool to its full potential!